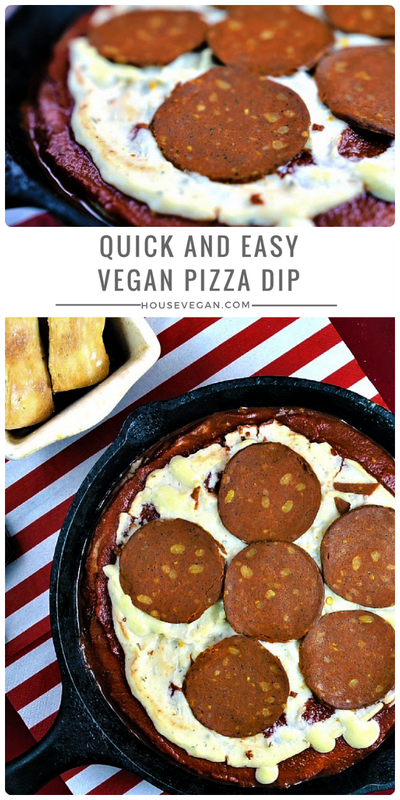 Before telling you about this Quick and Easy Vegan Pizza Dip we gotta go to that good ol' disclaimer: Housevegan.com is a participant in the Amazon Services LLC Associates Program, an affiliate advertising program designed to provide a means for sites to earn advertising fees by advertising and linking to Amazon.com. This post contains Amazon affiliate links. 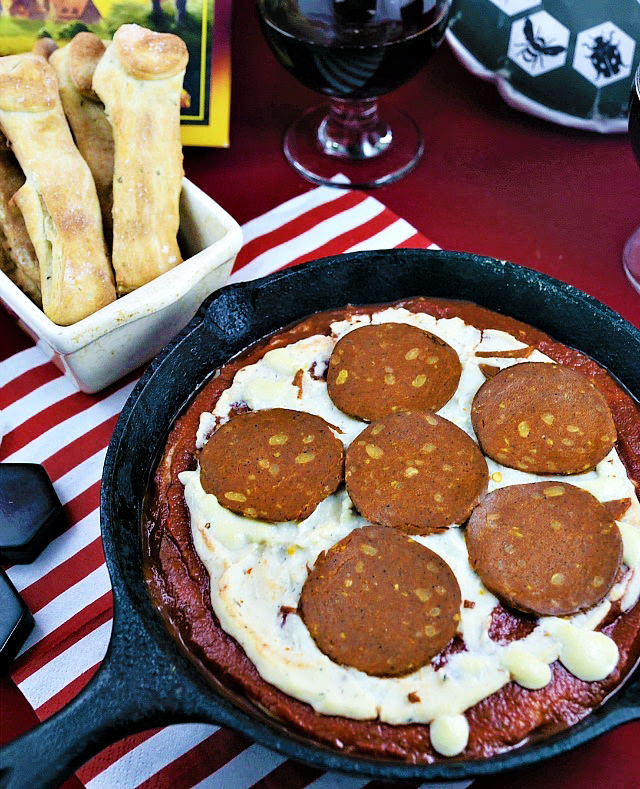 Confession: I've had this Vegan Pizza Dip in my draft folder for months. Actual months. Super lame, I know. You know how some posts just won't come together? No matter how great the recipe is, no matter how inspired you are to write about it? This was one of those. This dip is crazy good, but my first few drafts of this post? Not so much. Thankfully I found some inspiration recently when I was craving (duh) pizza. Pizza is one of those foods that people lose their minds over, but my love of pizza ended when I went vegan. I'm not that into most vegan cheese so I usually end up eating cheese-less pizzas which is basically vegetable bread. All this pizza weirdness changed though when my husband and I started going to a local pizza place, Conan's Pizza. Conan's has definitely awakened my interest in 'za. Conan's opened in the late 70s, and visiting our location is such a time warp! It's super comfortable with wooden nook and cranny booths lit by individual hanging lamps and decorated in Frank Frazetta art. They also have a few arcade games available to add to the ambiance. If my life was an 80s sitcom Conan's would be my group's hangout. It seems like such an unlikely place to have vegan options, but they do! We love going there on date nights for pizza and a pitcher. I'm still eating vegetable bread, but for some reason, it's extra delicious here. They also carry Daiya which is great for those days that I'm into that. Being able to go to a pizza place as a vegan has definitely renewed my enjoyment of pizza. However, sometimes we can't get to Conan's and don't want to wait for delivery (they deliver too!). 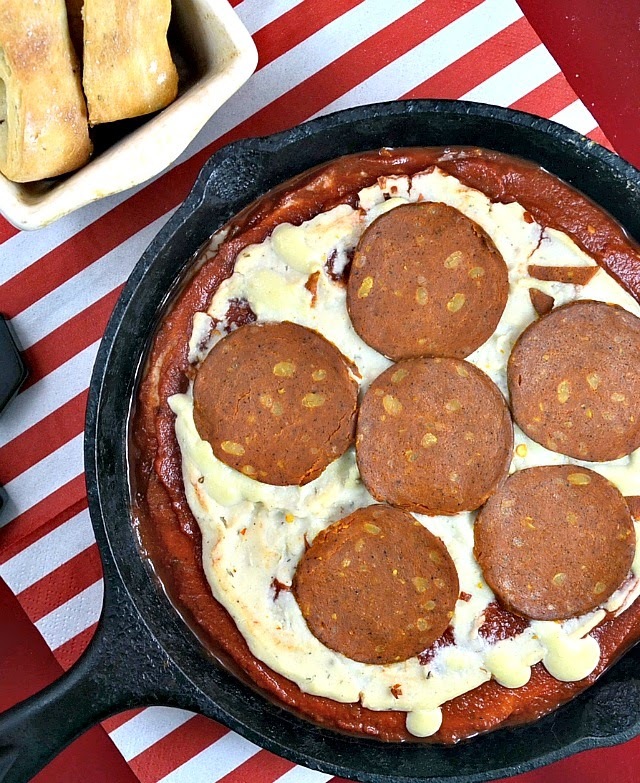 Luckily, this dip is really really good, very easy to put together, and definitely, satisfies pizza cravings - especially if served with breadsticks for dipping. We've eaten it as a snack, and as a meal with happy success. Also, this recipe is bean and cashew based so it's not as heavy as sour cream, cream cheese, or tofu based dips. Gotta love that! 1. In a nut grinder or a strong blender, grind the cashews just until they're powdery. In a small saucepan combine the cashew powder, nutritional yeast, salt, and water. Place the pan on the stove over medium heat, and whisk continuously until the mixture thickens. 2. In a blender or food processor combine the cashew mixture, beans, Italian seasoning, garlic powder and onion powder. Process the mixture just until it's pureed and combined. It should be pretty thick. Salt the dip to taste. 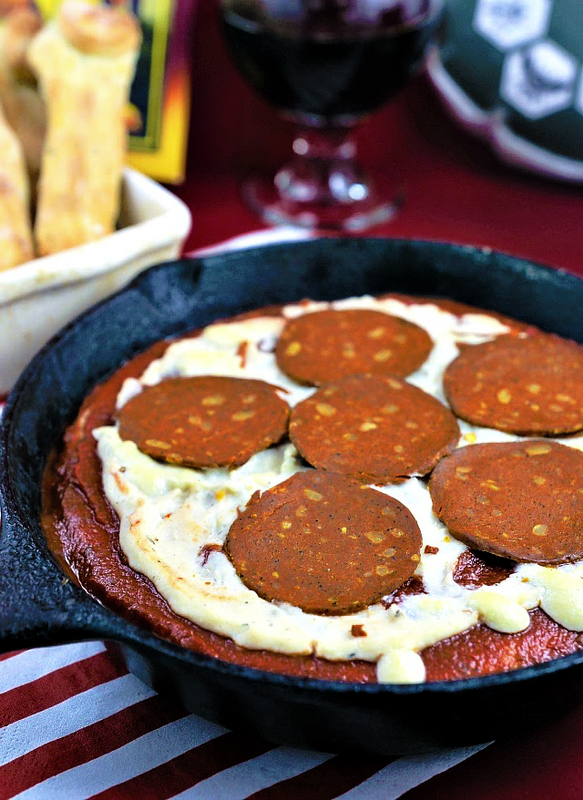 Your favorite pizza toppings like vegan pepperoni, seitan, vegan cheese, bell peppers, mushrooms, olives, etc. 2. 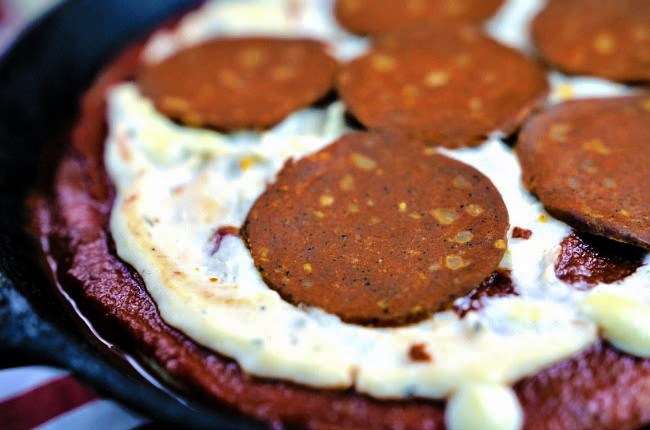 Spread a thin layer of pizza sauce onto the bottom of an oven safe dish. Top with a big dollop of the bean mixture and carefully spread it over the pizza sauce. Top the bean layer with a layer of pizza toppings. 3. Repeat this layering process until you're out of pizza sauce and dip - making sure the top layer is toppings. Place the dip in the preheated oven, and bake until heated through about 10-15 minutes.